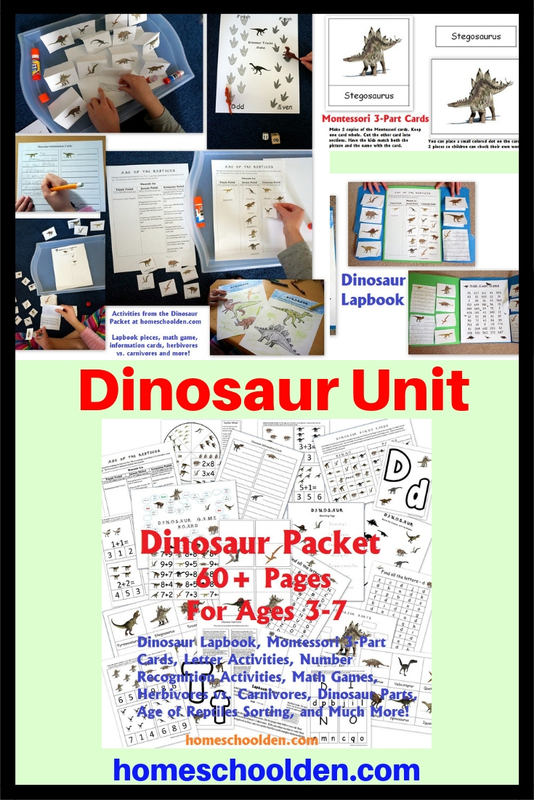 DD had an amazing time with this Dinosaur Unit! 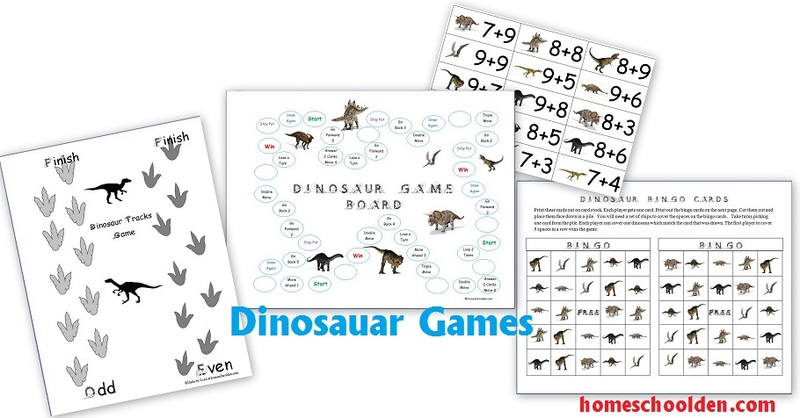 She did everything from learning many of the dinosaur’s names, to finding out what they ate, what period they lived in, and a number of dinosaur games along the way! 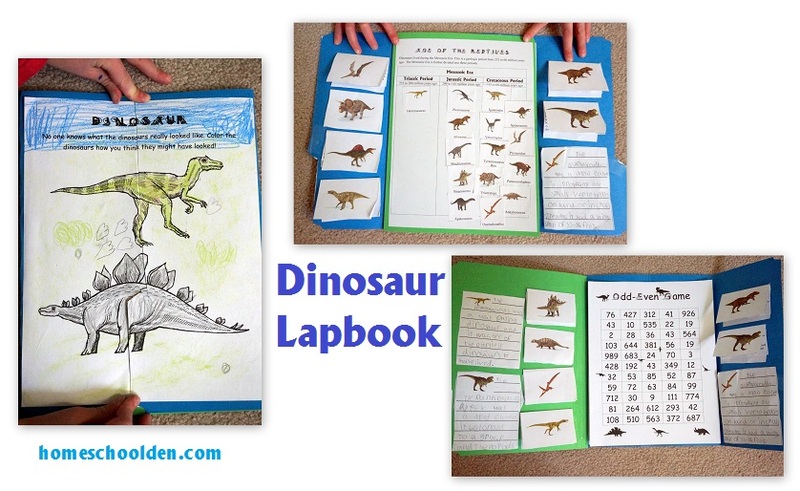 She worked really hard to complete a dinosaur lapbook, the first one she’s done in quite a while. She was very proud of the final product! She did a lot of writing and really enjoyed all the games and activities we did during this unit. 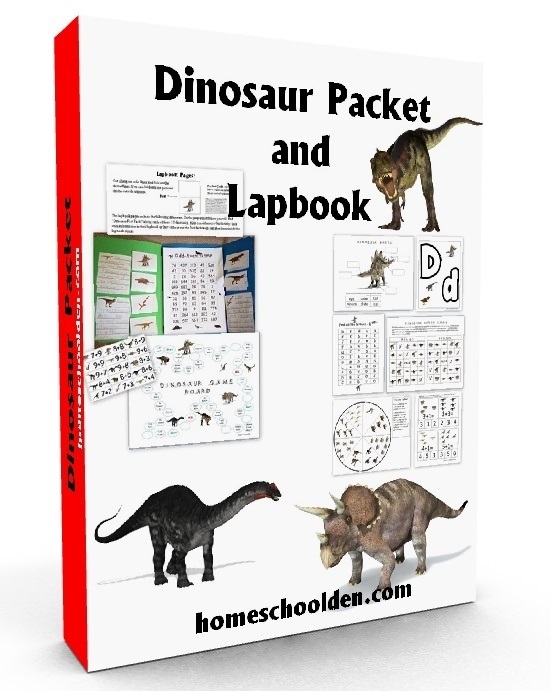 In her lapbook, she sorted the dinosaurs into the periods in which they lived. 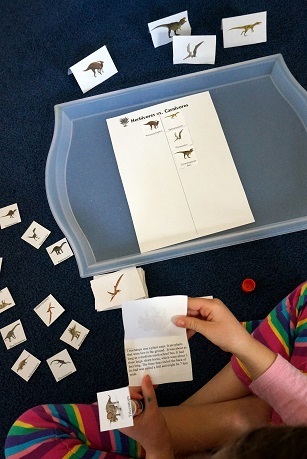 She also learned a bit about each dinosaur and chose several to write about. 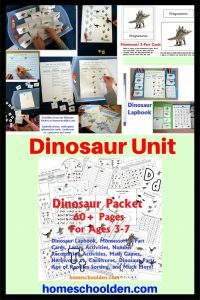 Since my kids were interested in dinosaurs at a very young age, I decided to make a number of pages for younger kids as well (I’ll share more pictures below.) The result is a very large packet!! It has more than 60 pages! I’ll share some close-ups of the various pages in this packet down below. 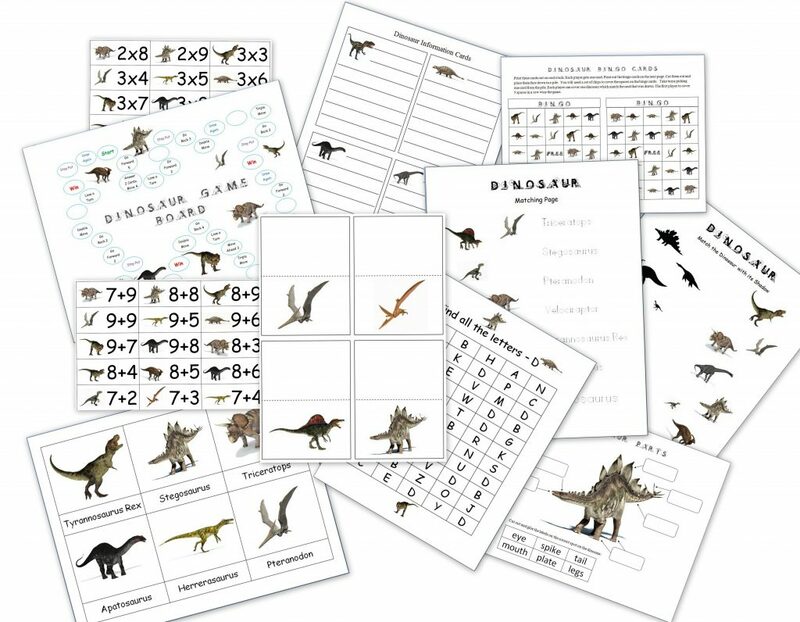 Our Dinosaur Packet contains a dinosaur lapbook, Montessori 3-Part cards, Dinosaur Fast Fact cards, Information cards, math games, letter recognition and number recognition activities, coloring, matching, herbivore vs. carnivore sorting, and so much more! I kept adding more activities — and it is now over 60 pages of activities… This includes two pdfs — one is 46 pages (portrait), the other is 26 (landscape). Hopefully you’ll find everything you need to have an *amazing* time with your kids! This packet is $4.00. When you click on the link below, it will take you directly to paypal. You will receive the two files immediately after payment is received. NOTE: When you click on the Buy Now button below, it will take you to Paypal. Upon receipt of payment you will immediately get a link to download this pdf in your browser. 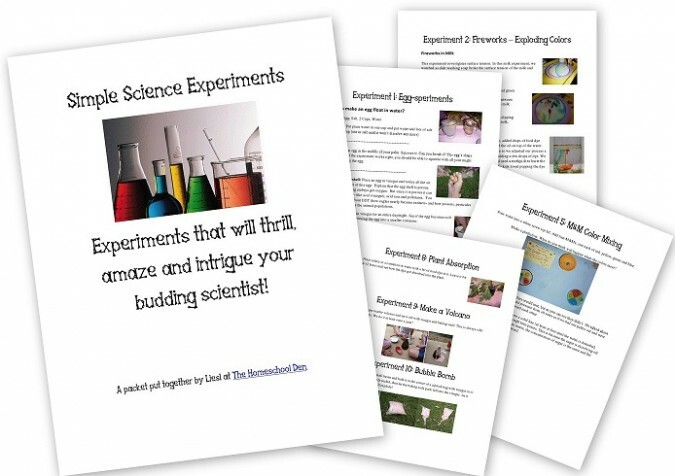 You will also receive an email from SendOwl Downloads which will give you a link to download. Remember, you do not have to have a Paypal account to make a payment. Just click on the line that says, “Pay with a debit or credit card or PayPal credit.” That gives you the option of paying with a credit card even if you don’t have an actual Paypal account. 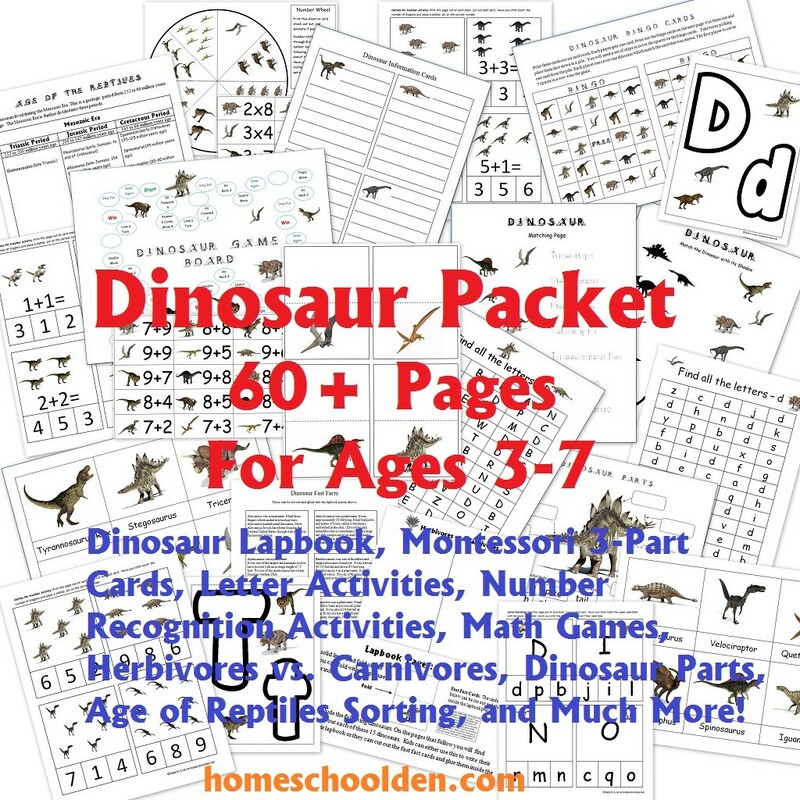 If you have any trouble with your order, please contact me (Liesl) via email– liesl at homeschoolden dot com, by replying to the email you receive from Sendowl, or by leaving a message over at our Homeschool Den Facebook Page. Once you place your order, you will receive a link to download this packet in your browser. You will also receive an email from SendOwl (the service I use) with the transaction link. When you click that link, it will also bring up the links to download the pdfs. And, if you have any trouble be sure to email me! What is a Lapbook? 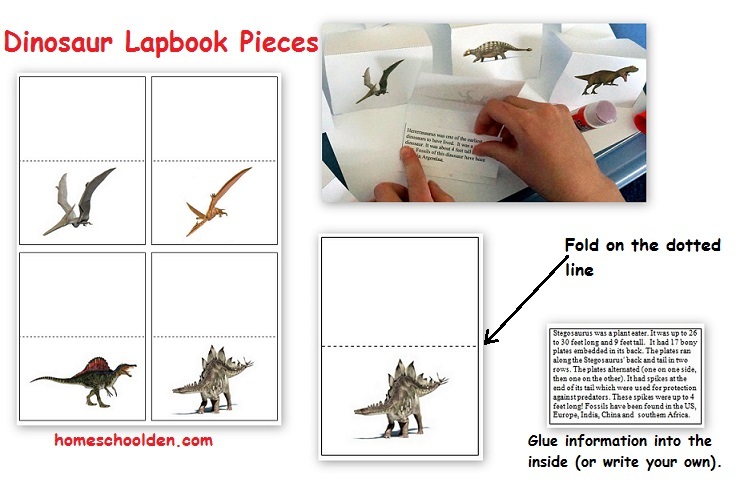 A lapbook is a project book that kids can hold in their lap. It is usually made from a manila folder (or two) that is used to display different foldables, mini-books and other materials. It provides a space for displaying graphic, written material, games, manipulatives and other educational materials. 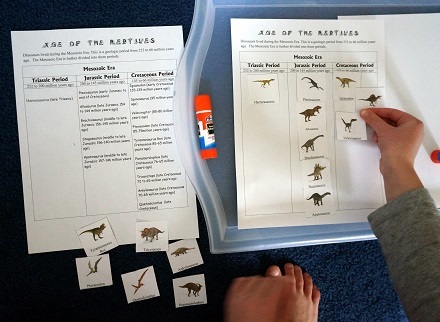 After my daughter put together the lapbook pieces, she spent time on the Age of Reptiles pages. I printed out both the page with the time period when the dinosaurs lived and the blank Age of Reptiles page. 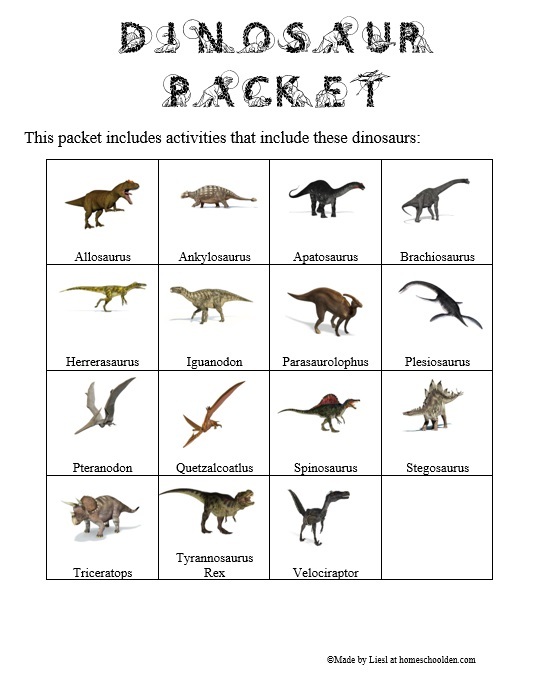 Day 1: We went through the page together and she matched the lapbook pieces with the picture and put all the dinosaurs in order (there are dinosaurs from each of the three periods: Triassic, Jurassic and Cretaceous Periods). 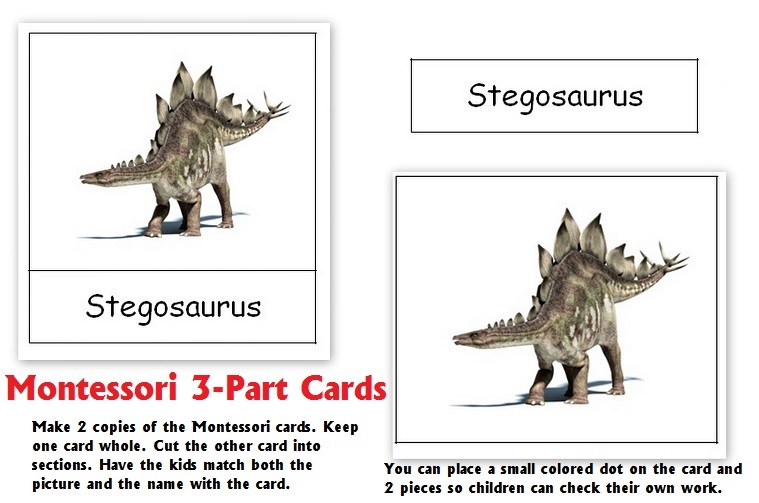 You can also use the Montessori 3-part cards for this. 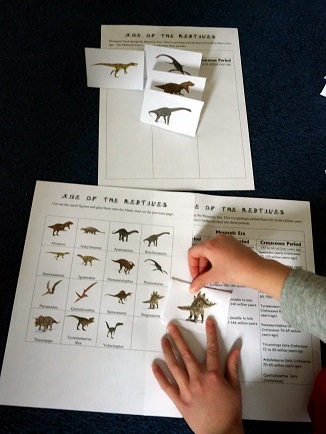 Day 2: She cut out the small dinosaur squares and glued those onto the Age of Reptiles page. 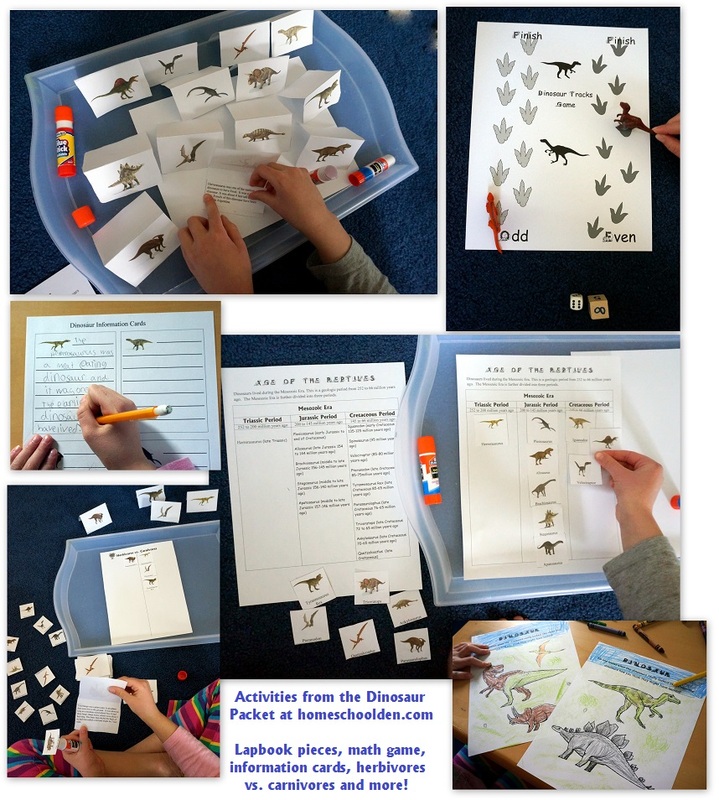 Day 3: Using the information in from the Dinosaur Fast Facts (in her lapbook pieces), she sorted the dinosaurs into herbivores and carnivores. 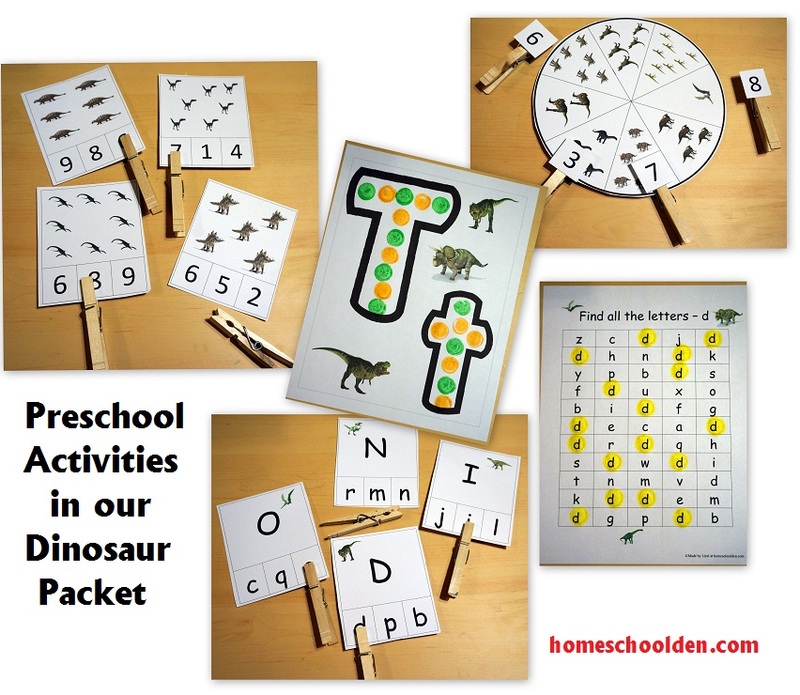 Our packet contains 15 Montessori cards. You will need to print out two sets of the cards. I usually print cards out on card stock for durability. Odd-Even Game: We played the Odd-Even Game several times (pictured in the collage below on the right). She rolled two dice and added them together. If she got an even number, she could move ahead one space. Then it was my turn. Since I was traveling along the odd dinosaur tracks, I could only move forward if the sum of the dice I rolled was odd. That’s about it! This project was much more time consuming than I anticipated, but it was a blast to put together! It grew steadily from 30 pages to 40 to 50… to well over 60!! 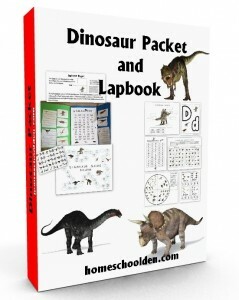 I hope some other dinosaur lovers will have fun with our packet!! Hi I have a 4 year old I will be using this with. So would I just use the first file and add to it from the second file as he gets older? Thanks it looks great. How many different dinosaurs are in the set?